UPDATE: THE male snake that slithered away victorious after falling three storeys during a fight with another male has claimed his prize. 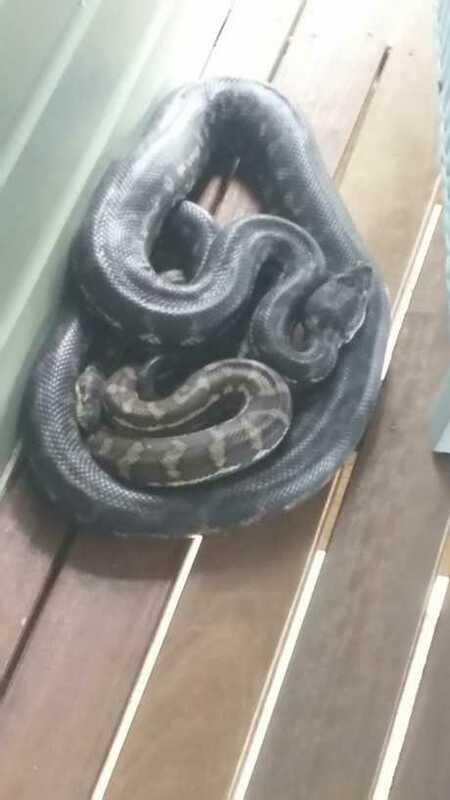 The two large male pythons were fighting over a female when they fell from the roof of a Cooroy home. 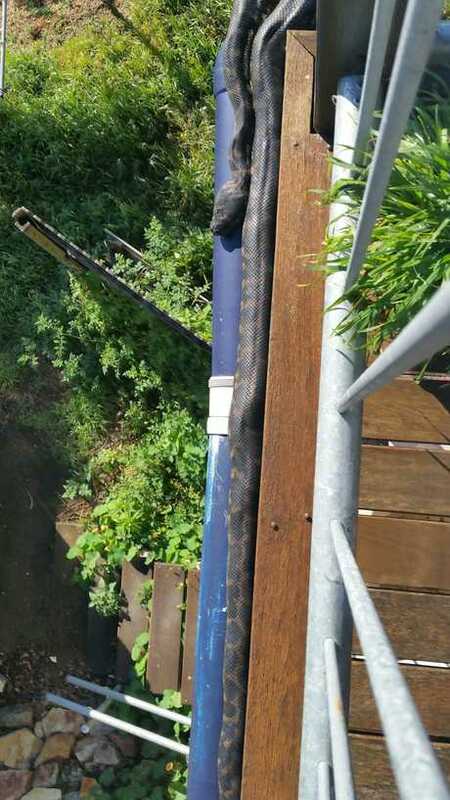 The winning python climbed back up two storeys to take up residence behind a cane couch on the veranda. This morning, homeowner Gillian Bradley came out to find the large python and the female mating. They then discovered the female has been living in the structure of the cane couch under the cushions. Bill Pledger from William Pledger's Wildlife Management Service said that explains why the big male climbed back up. "Chances are he'd spotted her at some point. When I found him he was under the couch and she was behind the couch." Mr Pledger was called to remove the snakes. He said they will be relocated in the catchment area. Had they not been relocated, Mr Pledger said in about three months time the home owners would have been mowing the lawn and discovered a heap of snakes. "More than likely the female would go under the house and find a warm spot, create a hollow in some mulch and pull it up over itself and it would lay there until the eggs were hatched. "It takes 55 for days from the time the eggs are laid to when they hatched and she might go out and get one feed during this period. "If it had stayed hidden at Christmas time they would have found about 20 snakes. "Snakes can have up to 50-60 snakes but the average 34-35. They are on their own from the day they are born so from a clutch of eggs about half of them will survive." William Pledger's Wildlife Management Service relocates snakes, possums, birds and microbats. You can contact him on his Facebook page or call 0414 075 314. EARLIER: TWO male snakes, most likely fighting over a female, have fallen three storeys - and continued fighting. Cooroy resident Gillian Bradley filmed the snakes as they hung from her roof, trying to overpower one another, before they fell to the ground. She then filmed them as they continued their struggle before the smaller of the two snakes slid off into the bush. Ms Bradley said she discovered the snakes this morning when she ironically went out onto the veranda to check for snakes so her kitten could go out. "As I turned around I caught a glimpse of them hanging over the gutter. I quickly grabbed the cat and went back inside. Then it got more interesting after that." Ms Bradley said the snakes were hanging off the roof for about 10 minutes before they fell. "The smaller snake was wrapped around the larger snake, it was totally depended on it. When the larger snake dropped, the smaller snake went too. "They hit the ground and kept going, they weren't phased at all. "Then the smaller snake went down the paddock and the larger snake climbed back up onto the veranda. It is now asleep under the couch." At first the longtime Cooroy homeowner thought the snakes were mating but Snake Catcher Noosa's Luke Huntley viewed the footage and said the snakes were two males, most likely fighting over a female somewhere in the house. "When snakes mate it is a lot slower than that. "When male pythons fight, they use the top third of their body, trying to hit each other. "There's a female somewhere in the wall or in the roof and both male pythons went to the house for her. "It started there, they probably both found the female at the same time, fought, the smaller took off, the larger snake went back up. "He won, he'll go in the roof now and mate with that female. 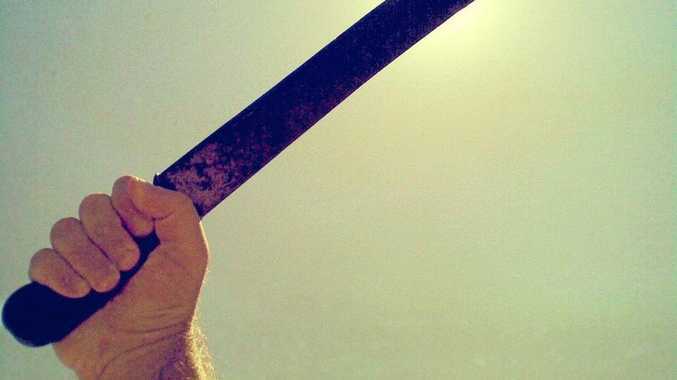 I wouldn't be surprised if the homeowners hear some banging and sliding." And that's not to say another male snake won't come along. Just two and a half weeks ago, Mr Huntley removed and relocated another large python from Ms Bradley's property. Mr Huntley said as long as there is a female male snakes will keep coming until she moves on. "If it was possible to remove the female then you remove the pheromones and the males will look elsewhere." Mr Huntley said at the moment male snakes are out looking for females and female snakes are waiting for males. "Right now we are in breeding season and the first snakes to start coming active are pythons. "Last week and a half we've started seeing eastern brown snakes. There's plenty of them around." Mr Huntley is a registered and certified snake and reptile handler, servicing the Noosa Shire and surrounding areas. You can contact him via his Facebook page or on 0499 902 290.